Help children with autism or Asperger's learn how to understand and handle the nuances of social interactions and improve oral language skills. 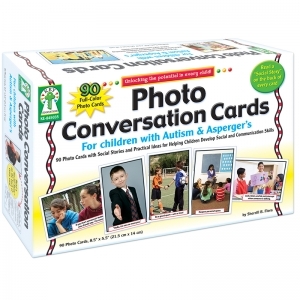 Use each photo card and its accompanying social/communication skills story to discuss specific social situations and possible actions or reactions by those involved. Includes an index of the topics on the back of the box for easy reference. Key Education products are intended to engage and educate young and special learners, as well as assist teachers in building a strong and developmentally appropriate curriculum for these children. 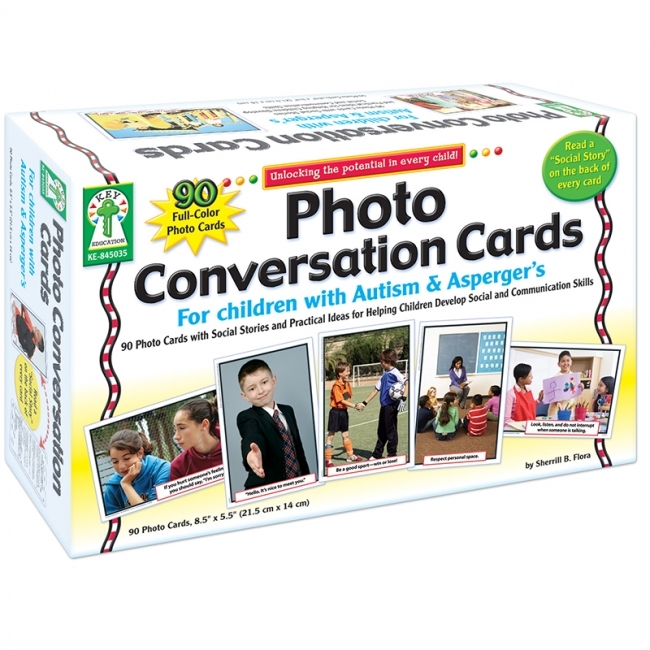 The product line, comprised of teacher/parent resource books, photographic learning cards, and other activity- and game-oriented materials, is designed to assist in Unlocking the Potential in Every Child. 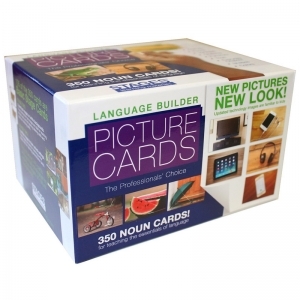 This 350 card set includes stunning, child-pleasing, bright, photographic images from nine basic categories: animals, foods, vehicles, furniture, clothing, toys, everyday objects, shapes, and colors. The Language Builder: Picture Noun Card set is the only flashcard set to offer the Basic Stage Set. Fifteen images (105 cards) are Basic Stage Cards. In Stage One, two identical images are on white backgrounds. In Stage Two, five similar images are in their natural settings. The basic stage cards teach matching, labeling, and categorization skills. The back of each card is numbered and gives a label and category for the image, as well as suggested activities appropriate to the card. An included activity booklet provides more detailed instruction ideas. The cards are coated with a hi-gloss varnish for durability and all images appear horizontally for consistent presentation. The set also comes with divider cards, preprinted stickers for custom organizing, and a sturdy "work-from" box. Each card is a standard photo 3 .5" x 5" size to allow easy incorporation of your own pictures.